Phil McCarty, 38, was finishing 30 pull-ups in a friendly competition among friends at the Triple Threat gym in Jacksonville when he lost consciousness and fell 10 feet to the floor, landing on his back and bouncing his head twice on the concrete floor. This was exactly the wrong response, and Phil knew better. He was not only a paramedic of 20 years, but he had taught EMS for 10 years and worked as the Emergency Management coordinator for Morgan County and the city of Jacksonville. Fortunately, the group of friends surrounding him included several EMTs, a paramedic, an X-ray technician and a policeman. Phil made it to his car, but there was no way they were letting him drive or go home. When he got to Passavant Area Hospital, an initial CT scan showed an epidural bleed and a basal skull fracture. 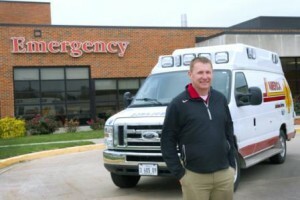 Scott Boston, MD, then-director of the Passavant Emergency Department, made arrangements for Phil’s immediate transfer to the Southern Illinois Trauma Center at Springfield’s Memorial Medical Center. That quick action saved Phil’s life. A 50-minute ambulance ride later, the trauma team in Springfield went to work on Phil, a guy they knew because he had brought hundreds of people to them in his role as an area EMT. John Sutyak, MD, EdM, associate professor of surgery at SIU HealthCare and director of the Southern Illinois Trauma Center, knew that time was critical for Phil’s survival. The team in Springfield was briefed and prepared when Phil was wheeled in. After a second CT scan, Springfield Clinic neurosurgeon Leslie Acakpo-Satchivi, MD, presented two options: a craniotomy or medication for 12 hours and then a craniotomy if the medication didn’t work. Phil chose the immediate craniotomy. After surgery, Phil spent four days in intensive care and several more days in general care before going home. After two weeks, he started physical therapy at Passavant. Within a month of returning home, he was able to return to work with few restrictions. Today, he is training for a half marathon in St. Louis, but he understands patience is key – he’s come a long way.